The USS Atlantis is a Galaxy Class Command Dreadnought that was launched in 2364. 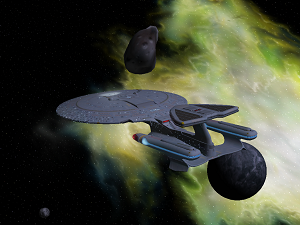 One of the first Galaxy Class starships launched, construction on the USS Atlantis was begun on Stardate 35780 and she was launched on Stardate 41450 from Utopia Planitia Fleet Yard under the command of Captain Jana Park as part of the 12th Fleet. Despite the advancements of the Galaxy Class design it was quickly discovered that an antiquated Transporter system had been installed aboard the vessel and requests were made for the unit to be upgraded to new specifications. Despite this Admiral Gregory Quinn denied the request unless the Atlantis agreed to return to Spacedock for the upgrade rather than for a Corps of Engineers vessel to meet up with the Atlantis. The Atlantis was retuned to Spacedock and the upgrades were completed; however, Captain Jana Park opted not to wait for her vessel to be repaired and transferred to the Starship Farragut. The Atlantis' Executive Officer was promoted to Captain and would serve at Atlantis' new Commanding Officer when she relaunched a year later as a member of the 8th Fleet. As part of her assignment the Atlantis was tasked with diplomatic missions on behalf of the United Federation of Planets, frequently welcoming new member worlds into the group. The Atlantis would excel in this role; however, with the discovery of the wormhole to the Gamma Quadrant, the Atlantis was reassigned to participate in a 2 year exploration mission of this region before being recalled due to the destruction of the USS Odyssey by Dominion forces. Following the loss of her sister ship, the USS Enterprise-D, Starfleet recalled the Atlantis to San Francisco Fleet Yard for high level reviews of the design and her construction. This was due to concerns that the Galaxy Class was a failed design after the destruction of 3 of the initial 6 vessels of the class launched in a very short period of time. As part of the review minor changes were completed and upgrades made to enhance the longevity of the design. Briefly Starfleet considered rechristening the Atlantis as the USS Enterprise-E in honor of the exploits of her sister ship; however, the Sovereign Class USS Honorius was selected for this distinction and Atlantis returned to service. She would be sent on a deep space exploration mission beyond the Cardassian Union as part of the 22nd Fleet. When the Cardassians announced that they had joined the Dominion on Stardate 50564 the Atlantis was quickly recalled back to Federation territory and was reassigned to the 7th Fleet. As part of her early assignments the Atlantis was with the Starfleet forces amassed for the Battle of Tyra. Led by Admiral Borren D'gret aboard the USS North Star, the Atlantis was one of only 14 ships to survive the engagement against 248 Cardassian and Dominion ships. She would become one of the lead ships in the 7th fleet and participated in the Battle of Sybaron and the Battle of the Tibor Nebula. The Atlantis would, temporarily, be reassigned to the 16th Fleet and assisted the USS Enterprise-E in the Battle of Ricktor Prime, again being one of the only vessels to return from a fierce combat zone. The Atlantis would then be returned to the 7th Fleet where it was assigned to the Kalandra Campaign and later was assigned to the 9th Fleet for the Battle of Cardassia. The Atlantis, aided by her Miranda Class support vessels, led an attack on a Dominion Battleship that was participating in the fight. The Atlantis was severely damaged, the ship boarded with nearly 81% of her crew killed, but was salvaged and repaired by Starfleet at the Bolarus Prime Shipyards. Redeployed to the 3rd Fleet in 2377, the Atlantis was assigned to the Regula Badlands and was part of the support group for Starbase 176. The Atlantis was on maneuvers when the Borg Collective overran the outpost and devastated the region. Alongside the USS Enterprise-E, the Atlantis was able to retake the region and was instrumental capturing the Borg Transwarp Portal in the region. Assigned to guard the portal, the Atlantis maintained Starfleet's hold on the region and defended against an attack by a group of Borg Spheres sent to secure the area. The Atlantis herself received minor damage in the attack and was able to tractor the severely damaged USS Valhalla from the region when the Transwarp Portal exploded shortly after it exited the aperture. Atlantis, having experienced little damage herself, was reassigned to the Sol Sector as a patrol vessel. Due to this assignment the Atlantis would be among the first vessels to greet the Intrepid Class USS Voyager when she returned to the Alpha Quadrant and would later face off against the Borg again during the Supercube crisis. When the Borg Invasion of 2381 began the Atlantis was assigned directly to Earth and outfitted with Transphasic Torpedoes as a last defense for the planet should the Borg invade. Despite her long standing history with the Collective, the Atlantis would not see any combat during this engagement. In the aftermath of the invasion, Starfleet assigned the Atlantis to the 11th Fleet as a Sector Command ship for the Sierra Sector under the command of Admiral Teplen Hux. Atlantis remained in this assignment for twenty years and was one of the most instrumental vessels in securing the Romulan Star Empire following the Hobus event. The Atlantis maintained strict monitoring of Romulan Space during this period as well to judge the stability of the region in the wake of the growing threat of the Klingon Empire. Due to the growing risk of conflict, Starfleet ordered the Atlantis to Utopia Planitia Fleet Yards to be upgraded to the standards of the Entente Subtype of the Galaxy Class, a process estimated to take 3 years to complete. The vessel was relaunched in 2404 and immediately sent to the front lines of the Federations conflict with the Klingons as a military command ship. Due to the tactical capabilities of the Atlantis she was quickly assigned to lead the Starfleet blockade of the Hromi Cluster - an act that led to open war. Atlantis was pulled from the front line and sent to Sherman's Planet as a patrol vessel, an act that would lead it to battle multiple times against the Gorn Hegemony and the Klingons. When the conflict ended in 2410, the Atlantis was returned to its exploratory nature and sent on an exploration mission in the far reaches of the Alpha Quadrant. The Atlantis would undertake two five year missions in which it made contact with over a dozen new races and charted several new regions of the Quadrant. In 2420 the Atlantis was recalled to San Francisco Fleet Yard where she underwent multiple tests to ensure her continued spaceworthiness as she was nearly 60 years old. Despite her age and the heavy combat she had seen, Atlantis was determined to be well above the norms for other ships of her class. It was agreed that the Atlantis would be upgraded once more - this time to match the specifications of the Avalon Subtype of the Galaxy Class. Due to the heavy modifications that essentially made Atlantis practically a new vessel her registry number was changed. Atlantis was relaunched in 2424 and assigned to the 16th Fleet. The Atlantis, due to her history, was chosen to oversee Starfleet's exploration of the Delta Quadrant and Captain Zaran Frost was selected to lead the mission.